On February 21, 2006, MSSA and the Wilderness Sportsmen's Club of Seeley Lake presented a proposal to the Montana State Land Board to salvage the only shooting range in the Seeley Lake area. The text of proposal that was submitted to the Land Board is below. The Wilderness Sportsmen Club (WSC) of Seeley Lake, a Montana non-profit corporation, currently manages a shooting range on land it leases from the State of Montana near the community of Seeley Lake. 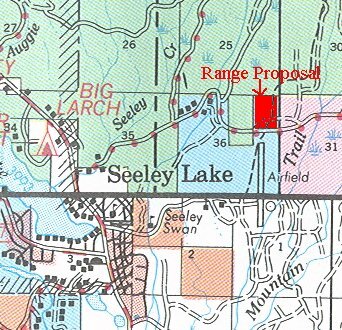 The WSC proposes that the State Land Board approve the transfer up to 60 acres of state land on and around the shooting range by the Department of Natural Resources and Conservation to the WSC for the purpose of continued maintenance and operation of this shooting facility, for the benefit of the public in the Seeley Lake area. Location. The property in question is the north half of the east half of the northeast quarter (about 60 acres) of Section 36, Township 17 North, Range 15 West, that portion lying north of the Cottonwood Lakes Road, Forest Service # 477. Map of area under consideration. A map is HERE. Availability of land. There is little private land available in the Seeley Lake area. Because of this limited supply, the cost of private land is prohibitive of the purchase of land sufficient to satisfy the public need for a local shooting facility. Cost. The cost of the current lease is being increased to the extent that it will be financially impossible for the WSC to continue to provide a safe shooting facility to the public of the Seeley Lake area. WSC a non-profit corporation. The WSC is a non-profit corporation, organized under the laws of Montana, registered with the Secretary of State, and in good standing. Need. As with most other Montana communities, the citizens of the Seeley Lake area have a high density of firearm ownership. Also, a significant portion of the population purchases hunting licenses each year. All of these people need a safe and suitable place to shoot. A safe and suitable place for these people to shoot will contribute to the safety of the community, and will minimize unsafe shooting at undeveloped locations. Absence of facilities. There is no other established shooting facility to serve the people of the Seeley Lake area. State law supports shooting ranges with established public policy. "76-9-101. Policy. It is the policy of the state of Montana to provide for the health, safety, and welfare of the citizens of the state by promoting the safety and enjoyment of the shooting sports among the citizens of the state and by protecting the locations of and investment in shooting ranges for shotgun, archery, rifle, and pistol shooting." State law countenances using state lands for shooting ranges. "87-1-279… (6) The department shall promote the use of publicly owned land for shooting range facilities. The department may negotiate with federal, state, and local agencies to encourage land trades, shared or specific use designations, and other mechanisms to provide land for shooting range facilities." Public interest - public service. The effect realized by approval of this proposal will be very much in the public interest, and will constitute a service to the public far beyond the dollar-denominated value of the land in question. State funds already invested; future interest to state. The Wilderness Sportsmen Club has received grant funds from the Department of Fish, Wildlife and Parks through the Shooting Range Development Program to improve the Seeley Lake Shooting Range. Thus, public funds are already invested in this established shooting facility. Also, as a part of the grant acceptance process, the WSC was required to legally transfer a future interest in their facility to FWP so that if the WSC should ever fail to maintain and operate the Seeley Lake Shooting Range, FWP has the legal authority to identify another community group to manage and operate the facility. The WSC is willing to renew this future interest to FWP if this proposal for the WSC to assume ownership of the range land is approved. The WSC is willing to agree to the following items as a part of this proposal, if ownership of the land in question can be transferred to the WSC. Hunter education. WSC agrees to allow the Seeley Lake Range to be used for training by FWP Hunter Education instructors and the FWP Hunter Education Program, as needed, forever. State to retain timber rights. The WSC is willing to accept that the State retain timber rights to the land in question, thereby minimizing any loss to the state school trust fund (understanding that the WSC will need to clear some portions of the land for ranges, parking and other facilities, but that such clearing will be kept to a minimum). Fire hazard reduction. The WSC will actively engage in a fire hazard reduction program on the land in question. Weed control. The WSC will actively pursue weed control on the land in question. Accept covenants. The WSC will accept covenants with the land specifying that the land may only be used for the purpose of a shooting range, together with the necessary adjuncts thereto. Survey and transfer costs. The WSC will pay the costs associated with transferring the property, including the cost of a survey of the property. Operate and maintain range. The WSC will operate and maintain the shooting range in perpetuity, paying all costs of operation and improvement, and allowing any member of the general public to become a member of the WSC if the applicant is eligible to purchase a Montana hunting license, and pays dues that are a reasonable share of the cost of WSC business. The WSC requests that the State Land Board direct the Department of Natural Resources and Conservation to execute the proposed land transfer, consistent with the terms of this proposal. Those named here (below) support the proposal that the State Land Board direct the Department of Natural Resources and Conservation to transfer 40+ acres of state lands to the Wilderness Sportsmen's Club of Seeley Lake for the purpose of providing a shooting range for the community of Seeley Lake. Question: Is the proposal to exchange parcels straight up? This is not a land swap. The proposal is that the Land Board direct DNRC to transfer to the WSC the land they currently occupy and lease, with conditions, rather than ending the current lease arrangement because of its unaffordability. Question: How would you argue that the transfer of the property without compensation to the School Trust squares with the Land Board's constitutional requirement to maximize the rate of return on the use and transfer of state properties? Philosophically, it's important to protect the Trust. Practically, this is a tiny parcel. If the WSC cannot obtain this relief, it will probably no longer be able to maintain its lease, so the lease income to the state will be lost anyway. The only real value to the School Trust is the timber on the property. The WSG will agree to let the state keep timber rights, to minimize negative impact on the School Trust. Plus, the WSC will assume financial responsibility for weed control and fuel hazard reduction, eliminating these costs for the state. Keeping the timber and shedding responsibility for weed control and forest management probably equates to zero loss for the Trust. Also, this is VERY MUCH in the public interest. This is the only established shooting range for 100 miles (50 north and 50 south). The people of the Seeley area need a safe and suitable, designated place to shoot, to conduct Hunter Education classes and firearm safety instruction. Without a designated and safe place to shoot, people living in the area will likely shoot in other, random places, possibly creating safety hazards and litter problems. Add the extreme public interest to the wash on the cost. On my scales, it would be a good deal for the people of Montana AND the people of Seeley Lake. Question: Won't this impact the School Trust? The School Trust impact is this: The state is going to lose the current lease, whether the land is donated to the club, or the club simply walks away from the unaffordable rent payments. No more income from rent, regardless. The state will retain the income stream from timber on the property (not much because the property is small), and the state will shed the expenses of weed and fire hazard control. So, on paper, the state will gain theoretical cash flow from the donation, although the amount will be tiny. Question: Won't this establish a precedent? Some Land Board members will surely ask themselves, and may ask others, "What kind of precedent will we establish? If we agree to this proposal, won't we have every special interest lined up for similar treatment?" The answer for the Land Board is, if it receives other proposals with as little cost and serving the public interest as fully, it should probably consider the request(s) seriously. The Land Board will likely be more concerned about serving the best public interest than about how many similar petitions might be created. Question: What about liability? How will this affect liability for the State? Implementing this proposal will actually decrease liability for the State. The State will be out of the ownership picture and not subject to liability claims, and the WSC will maintain liability insurance. Question: How much has the rent increased on the land in question? The Seeley club used to lease 45 acres of state land, but that much land became too expensive for them. They now lease only 5 acres, not enough for good safety at a shooting range. Four years ago, their lease was $400. Last year the lease price was $958. Next year is is supposed to be $2,500. Question: There seems to be some fuzziness about how many acres are involved. What's the deal? A quarter section is 160 acres. Half of a quarter (1/8) is 80 acres. The Seeley Lake club needs all of a 1/8th-section parcel that lies north of the Cottonwood Lakes Road, a Forest Service road that crosses this 1/8th section somewhere near the middle. The Seeley group needs the property up to this road for access reasons. That portion of the 1/8 section lying north of the FS road has not been surveyed. The Seeley group estimates that there are 41.6 acres in the parcel, but this is only an estimate. So, we have described the parcel either as "40+ acres" or "up to 60 acres" to cover the uncertainty until the parcel can be surveyed. See the map HERE.